The physics and astro/cosmology articles presented below are not organized in any particular order, and will be added to on an ongoing basis. They are simply meant for browsing; some may catch the reader's attention more than others. These fields frequently have a large speculative component to them, and are also rapidly changing due to new discoveries and interpretations. Some of them may contradict each other - that is the state of current knowledge. The articles presented below are not designed to present any particular viewpoint, but are simply articles that may be of interest. They are frequently not easy to understand, and may require some existing knowledge, at least on a layman's level, of current physics and cosmological issues. Enjoy! Physics studies how the matter in the universe behaves, with its associated forces and energies. Although historically philosophy has attached itself at times to a certain extent in the discipline, we are currently at a very materialistic place in physics. (And many would say, that's exactly as it should be.) Physics is important because all of the other sciences can trace their roots back to this basic understanding of the physical world. No physics = no chemistry, botany, biology, astronomy, etc. Physics is not an easy discipline even at its root; by the time one considers quantum physics, even the experts and big names will say that they don't really understand what is going on. Happily, however, if one leaves the math off to the side, the concepts of physics are understandable even to the lay person who is willing to put forth a little effort. It's fascinating and rewarding. It is, in fact, the world we live in (at least physically). Here's a portal to some basics physics concepts. Also, check out the videos for physics in the Videos section. Physics lends itself well to the visual and spacial. (Perhaps that's why men have traditionally been more attracted to the discipline than women, although that is changing.) In fact, physics in its simplified form is possibly best taught through videos. There are also quite a few popular physics books out there that have the purpose of teaching physics concepts to the lay person. Some of them are quite good. The Dance of Astrology has a brief history of physics and its concepts as well. Here on this site we are most interested in relativity and, especially, quantum mechanics. That's because these both point to new levels of reality or ways of looking at the universe that are only about a hundred years old. Fresh thinking brings fresh potentials for understanding. This is a fast-changing discipline, although at any given point in time many people will give out the party line that they are pretty sure about what they know. A hundred years from now, we'll see if that's still the case. And while scientists continue to try and pigeonhole astrology into a 19th century view of physics (where it is bound to fail), these newer discoveries in physics are pointing the way for gaps and possibilities in the knowledge of the world that astrology might eventually squeeze into. But this section is about physics, not astrology. Salman Amin Khan has been very successful and popular with his online site Khan Academy. Plus, he's from the suburb where I went to high school! But how do we know that relativity is real? Modern science is complicated and specialized. Most people can't really explain much about the theory of relativity, even though it has celebrated its 100th anniversary, and permeates popular culture. Quantum field theory for 5 year olds. Maybe. Surely there must be room for consciousness and astrology in there somewhere! What interpretations do quantum physicists themselves prefer? There are many attempts to "make quantum physics easy." (Again, videos seem more powerful in many ways.) You can have a crack at it with the next article, but the bottom line is: it's not easy. It's especially not easy because it requires us to accept a whole new way of looking at the world which is completely contrary to the billiard-balls-on-a-table variety of physics (Newtonian) that we learned in school. The following site does a pretty good job, but the rest of the articles following will not be so much concerned with teaching, but with what's going on in modern physics and cosmology, and will require some knowledge of these. The author below also addresses "quantum mysticism" through another page which is linked at the bottom of the main page. Like most mainstream physicists, he derides the use of quantum principles to justify New Age type of ideas. This is well-written and offers many needed caveats, as well as other necessary material for consideration. Nonetheless, there have been a parade of prominent physicists through the years (including Nobel prize winners) that have questioned how and whether the new world of quantum may be tied to larger philosophical speculations. So while it's true that there is much "quantum flapdoodle" out there, it's also true that these issues are not as settled as many physicists would have folks believe. All computers, cell phones, and other electronics are made of transistors. Here's a very brief page on one of the weirdnesses of quantum. Along with other quantum effects, it underlies the workings of the transistor. Here's a great explanation. Notice how simple Heisenberg's equation actually is. "This is perhaps the most famous equation next to E=mc2 in physics." Truth is often simple and elegant, yet with great implications. Why Hell can't freeze over: "Classical" physics (of which relativity is only a modification) would allow motion to stop, the river to freeze, an object to just sit there without any energy or movement. However, in this most interesting and simple of articles, we find that this is not possible in the quantum world. In the quantum world, thanks to Heisenberg's wonderfully simple equations, we find that motion and energy are built into the universe. The universe is a dynamic, humming sea of energy that is ever-changing, and has no rest.. We are definitely not in Kansas anymore! Here's a scholarly site that gives an example of how quantum and relativity are different, and yet may work together. Not ultimately (that's the subject of the articles above), but in a way that shows what both are about. Here, the double slit may be performed in two different frames of reference. We find that a) the experiment works the same in both, giving the same results in different frames of reference. That's relativity. But in the example, we also find that b) the double slit experiments themselves will yield results that are unpredictable except on a probabilistic basis, and will demonstrate varying results (wave vs. particle) depending upon observer/measurement technique. That's quantum. But what IS time? Turns out, time is a much more complicated concept than it seems. In fact, much like quantum, no one really even knows what it is. It's very important, however, and not just in the scheduling of our daily lives. Einstein showed that time could join length, width, and height as a descriptor of the world, the vaunted "4th dimension." We now exist not just in space, but in spacetime: we are provided more accurate coordinates. However, modern physicists can't even agree as to whether time is "real" (in the sense of a primordial principle of the universe), or whether it is a property overlaid on more core principles, an "emergent" property of the universe. Both gravity and time have been mentioned as possibly being properties that "emerge" from quantum mechanics. But what did quantum mechanics emerge from? WHY do those damn philosophers keep gumming up my pristine calculations?? Here's a formal theory which supports a "block universe." The block universe works equally well in any direction. But why do we experience time as moving in one direction? Here's some heavy thinking on the block universe thing. It's a bit of a brain twister to try and follow him allowing the block universe to accommodate free will. And what about that quantum probability vs certainty thing, which is accepted by most physicists? Paradigms are not something that most people sit around and think about. That includes scientists as well as lay people. The reason is simple: For most purposes, they are invisible. They are thought patterns and assumptions that are so deeply ingrained within us that we are not even aware of them. It's kind of like water to a fish or air to a bird: they are the medium that we live our intellectual lives in. That can, however, cause problems when our paradigms don't match reality. Science itself may be seen as the search for new and better paradigms. However, that doesn't mean that scientists themselves don't fall prey to being unhealthily attached to their favorite paradigms: they're human, too. Paradigms are things such as: Everything is connected (Eastern philosophy) or Everything is separate from everything else, but may interact (Western philosophy). The earth is the center of the universe (pre-Copernican position) or the earth revolves around the sun, which revolves around the galaxy, which... (modern position). Most things that are new are resisted; relativity and quantum certainly were. The reason that it's valuable to study the idea of paradigms is simply to help us stay open-minded in our quest for the truth. Here's a wiki article on the subject, leaning heavily on Thomas S. Kuhn's The Structure of Scientific Revolutions. Paradigms aren't just scientific, however: they permeate everything in our lives, from our own examinations of our selves, to our families, to our place in the world, to how the world works. We haven't reached the Metaphysics section yet, but here's a taste. In a unified reality, all of this blurs together. Can quantum phenomena apply to the macro (our scale) world, and not just at the atomic scale? A history of Quantum Mysticism (scholarly). The author focuses on the founders, but leaves out the important era of the Fundamental Fysiks Group in the 1970s. The subject will be back again. In the meantime, shut up and compute! The strangeness of quantum has attracted some very deep minds with some very deep speculations. None of them (unlike classical physics and relativity) have universal acceptance. Take your pick. Here's someone that's really gung-ho for the consciousness/physics thing. It's a review of the book Quantum Enigma mentioned above by Bruce Rosenblum. The reviewer correctly points out that if there were something to these sorts of theories, it would by far be the most important discovery since Newton/Einstein/Quantum. If. Wheeler's delayed choice experiment. Here, moving matter seems to know in advance which way we will direct or measure it. What does this say about the universe or reality? Maybe the static block idea of spacetime is correct after all. Or maybe not. We are in such odd, speculative territory here that we have no idea. Here's the pros. Here, the author warns "Don't trap your mind in a logical framework..." Because the point again is this: the quantum world works, we use it, and yet the quantum world isn't logical by our entrenched Newtonian/Einsteinian minds. By trying to understand it according to those standards, we are entirely missing the point. Unfortunately, we actually don't even know what the point is yet. :( Bummer. Wish I could live forever to find out! What is a particle? What is a wave? OK, that stuff above was too easy. Let's move on to something really odd. Quantum's full of 'em. If you have the time, the following goes straight to the heart of quantum mechanics. It is the thought experiment that Einstein felt confident would get rid of quantum mechanics. Unfortunately for him, it didn't. He spent much of the last 20 years of his life continuing to try and disprove quantum. The most brilliant physicist of all time, after overthrowing Newton, ultimately couldn't move beyond most of Newton's view. On the other hand, even though the Bell experiments showed that it was mathematically impossible, there are those who still cling to the idea that hidden variables will ultimately return things to a Newtonian, classical physics plane. Many people really don't like uncertainty, let alone entanglement. And, here's the New York Times celebrating the 50th anniversary of Bell's ideas. Einstein did not live to see Bell's ideas accepted and verified through tests. It is an unresolvable but interesting speculation as to whether or not he may have changed his mind about quantum had he lived this long. Physicists are humans, and are thus attached to their ideas and opinions just like the rest of us, but are also theoretically are more open to new information. This information was not available in Einstein's day. We'll never know. But there may indeed be loopholes. The fact is, the idea of "proof" only exists in mathematics. It does not exist in science. You cannot "prove" that the sun will come up tomorrow. It's only very, very likely. Science is always a "best answer" exploration of our world. There are even those who question whether one of the universe's great constants, the speed of light, will eventually be exceeded. However, every test of Einstein and this constant shows the original concept to be correct. Things such as Heisenberg's "uncertainty principle" would have huge implications for reality (and fate vs. free will) if they were demonstrated to occur at the macro level. But what about "real life"? That calls for some deep philosophical as well as scientific thinking. Unlike traditional physics, which has an "analog" character, quantum has more of a "digital" feel. In fact, the very word quantum comes from "quanta," which was being used to describe discrete packets of energy. Might all of reality be digital? Science in action! Here's a short article about the Higgs boson (the "God Particle") that was written shortly before the Higgs was actually found and verified at CERN. So science is: speculation, theory, and reality. Seems like a simple question: if I am traveling at the speed of light, can I see my reflection in a mirror? Things aren't always what they seem, however! Wiki on quantum entanglement. Along with superposition, this brings us into the modern world from that of classical physics. The mystics have said that "everything is connected." Might that be true? Big, small. It's all relative. Do we move at the speed of light relative to light? Yes, sort of. It's tricky. Back to quantum. Does an electron in wave form have mass? Let quantum physics pioneer deBroglie himself explain it towards the end. He also says "These are difficult questions and to discuss them would take us too far and even to the confines of philosophy." That damn philosophy again. The world seems shot through with it. Is nothing simple anymore? Just plain old physics? No. "The problem you have here, is not physical, but rather philosophical. Your reluctancy to accept quantum mechanics is based on your intuition gained from living in a "classical world." What's up with physics these days? Oh, nothing. Exotic theories such as the multiverse, string theory, and supersymmetry are glamorous and have become the darlings of physics for some, because they promise a tantalizing vision that might unite the disconnected threads. But unless more evidence starts piling up, they will have to ultimately take their places with other promising footnotes in science. Search for the pdf. "Scientists achieve reliable quantum teleportation for the first time." Yes, you read that right. It's refreshing to see comments below an article that don't have a "trollish" flavor to them. Here's another person's attempts to tackle the quantum/Einstein issue. Another effort that has been having a bit of a place in the sun just recently is Pilot Wave theory. This would also turn quantum back into classical physics. 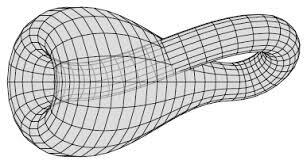 It was originally proposed by Louis de Broglie in 1927, and became a darling of David Bohm, who also put much effort into it. OK, you guys. Hold it right there. What's going on here? That quantum stuff is exhausting! Let's switch gears. How many stars are there? The generic ballpark used to be something like 100 billion stars in our Milky Way galaxy, 100 billion galaxies in the universe. That number seems to be expanding greatly just recently. When the new James Webb space telescope supersedes the current Hubble telescope shortly, our knowledge will also likely be superseded. The real answer? Lots. Are there more stars out there in the sky than all of the grains of sand on all of the beaches of earth? Good question. Short answer: yes. Wow. The "standard" black hole story. Stephen Hawking is the current expert on black holes, and has added much to our knowledge and speculation. The stereotype of a black hole is that it just keeps taking in more and more matter that ventures too close, which would seem to make black holes as eternal and ever-increasing. The current thinking, however, is that (due to quantum processes: you just can't get away from quantum) black holes not only aren't black, but that they eventually "evaporate" and disappear, although that would take a veeerrry long time. The process is cousin to the "vacuum energy" dynamics mentioned above. So maybe our universe came from a single tiny black hole. If that were the case, then where did that black hole exist or come from? You can go on and on with this stuff. Don't put your brain away yet. Let's keep going. 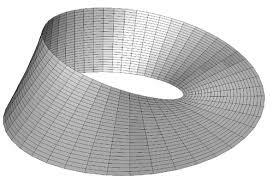 Black holes, wormholes, and quantum spacetime. Here's a teaser. Go to the library or sign up. And then there's Dark Matter and Dark Energy. You know, come to think about it, we really do have a long way to go to figure out this universe of ours. Everything you see in the universe around you? It's really only about 5% of what's really there. The rest? We just can't find it or see it or know what it is. Even though it's right in front of us and all around us. Sit on that for a while. A graphic from the Scientific American article "The Puzzle of Dark Energy": search for full pdf. It's mysterious enough to wonder where the universe came from. But where is it going to? OK, here's a chart. See that tiny slice that says "atoms 4.6%"? That's the part of the universe (including all of the galaxies, stars, and planets) that we can actually see. Wow. Two amazing concepts. One: In Einsteinian space-time, nothing can go faster than the speed of light. But the expansion of the universe is being caused by the expansion of space itself. Therefore, we may never even be aware of galaxies that are on the far side of the universe, because they may be moving away from us faster than the speed of light, and therefore their light will never reach us. Double Wow. 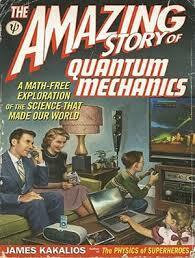 And you thought quantum was odd! People used to think that the earth was flat, right? That universe is just too big. Let's go back to the small. How small? Well, the quantum world regularly references "the Planck scale." A proton in an atom's nucleus is about 100 million trillion times larger than the Planck length. That small. Here's a question that makes sense: if atoms are 99.999% empty space, then why can't matter simply "pass through" other matter? Here, we can thank our buddy Wolfgang Pauli, who discussed his dreams with Carl Jung; together they came up with the idea of synchronicity, the subject of another section. And even though this is Phys.org, they have made a mistake. The title of the article concerns general relativity, but the topic is really matter/energy equivalence, a different brilliant insight of Einstein's. Fun illustration, though. How strong must gravity be to affect time? What the heck IS real? Why is it possible that consciousness may collapse the wave function? Seems like a pretty straightforward question. However, the answers on our expert site give a very clear view towards the state of quantum interpretations at this time: they're a mess. We keep hearing that "everything is energy." Is that true? Physics is full of "thought experiments." One of them is "Wigner's friend." The oddities just keep coming. That's why science is always in progress, and never arriving. "Scientism." The belief that science is all there is, will be able to explain everything, and is infallible. That doesn't sound very scientific.